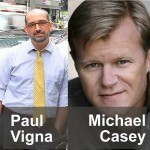 Paul Vigna is a markets reporter for The Wall Street Journal, covering equities and the economy. He writes for the MoneyBeat blog and hosts a daily news show of the same name. Paul & Michael are co-authors of the new book The Age of Cryptocurrency.